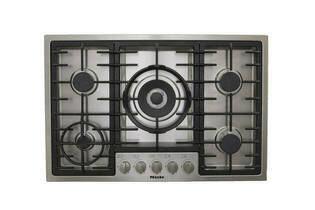 Snapshot: The Miele KM 2334 G gas cooktop has 5 burners and flame-failure protection. How well does it cook? Has flame-failure protection (the flame reignites). Very good burner layout (wok burner at centre, medium and simmer burners at the front). Fits pots on all five burners at once. Has a wok and small pot trivet.